A Cart-Away Delivery System can save you short-load fees, labor, and scheduling headaches. Buying Cart-Away equipment can improve your efficiencies in each of the four-stages of concrete production. We have equipment that efficiently loads material into mixers. Our mixers utilize a variety of mixing technologies to give you several mixing options to make quality, long-lasting concrete. 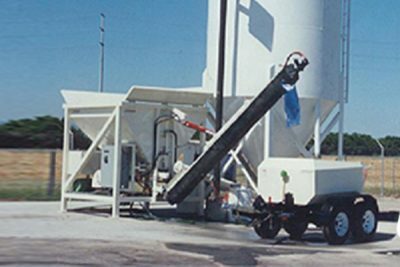 Each Cart-Away product provides a unique way to deliver the concrete mixture to your projects. We carefully designed each mixer and loader to be durable, safe, simple, and to have all the cleaning and maintenance features built into all of our equipment to make clean-up just as easy. We hope you’ll love your Cart-Away equipment as much as we do. The first step on concrete production is loading the raw materials, cement and water into the mixer. We have several options when it comes to loading dry mix into mixers such as the LoadPro, Top Loader, or our Mini Belt Loader. Choosing a loader will depend on the type of mixer you have and what will meet your needs. Once material is loaded you need complete blending. Cart-Away mixers use robust and efficient blending technology to insure that you produce a quality concrete mixture. Choosing the right portable concrete mixer can be challenging. Cart-Away offers several options you can choose from depending on the size of your projects and your portability needs. Give us a call and we can give you more information that can help you decide on the best tool for your needs. Dispensing the mixed concrete to the forms can present its own unique challenges. Cart-Away has several solutions. Cart-Away has equipment uniquely designed to guide the mixture into the right areas. Our equipment can tilt to dump, spin in two directions, dispense from a 6” tube, flow down a chute or pump concrete through a hose. Cart-Away will make dispensing concrete easy and clean-up hassle-free. Finally, keeping your equipment free of concrete build-up must also be considered in your purchase. Here prevention and good design makes Cart-Away unique. Taking steps to clean-up is an important time-saving practice that improves efficiency and maximizes the life of your equipment. Cart-Away plans specifically for this step. Surfaces are coated with high-gloss materials. Drums tilt for easy washout. The combination of CartShield and SplashGuard keep concrete from sticking to exposed surfaces. The PortaWash on-board water option helps to keep your mixer looking sharp. High delivery fees on small quantities of concrete called “short-load” fees are a big problem. Solving this problem has lead to a profitable business niche and a line of unique mixing systems. The first story began in 1973 when the U-cart business model was developed in answer to high delivery fees using concrete trucks. This first solution provided concrete users with a tow-it-yourself trailer to deliver concrete with their truck. This revolutionized the concrete delivery industry just like U-haul did for the moving of households. Over the years the U-cart model has become an indispensable service in many communities, and Cart-Away is the leader in providing trailers and loaders for this niche market. Contractors, homeowners, handymen, and municipalities depend upon Cart-Away trailers to satisfy their concrete needs. 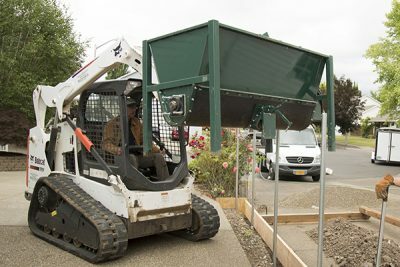 The second story started when concrete in a portable concrete mixer became a critical element in nearly every construction project. Cart-Away equipment users found that owning a mixer of their own was more profitable than borrowing one from the local U-cart. Today, there are hundreds of U-cart style businesses in the US and Canada. Thousands of Cart-Away towable and portable concrete mixers are on the road every day delivering quality concrete. This revolution in the industry has saved millions of dollars in short-load fees, lost labor time and operational frustration. In addition, Cart-Away mixing and delivery systems are hard at work in city fleets, government properties, and Military Installations. and for contractors of every classification. From the beginning of this story even through today Cart-Away demonstrates that exceptional design and manufacturing can save you money. Let us demonstrate great results for you as well.